Petroleum and fuel dyes and markers are used in the coloration of petroleum products and derivatives for the purpose of reducing petroleum fuels and gases related issues. Petroleum and fuel dyes and markers are synthetic or organic, unsaturated aromatic substances that are capable of solubilizing in petroleum hydrocarbons and imparting intense coloration to the petroleum products. The capability of these products in solubilizing in lubricants, hydrocarbon oils, fuel additives, diesel and much more makes them the foremost attractive choice for petroleum and fuels coloration by the market players across the developed and developing regions around the globe. Moreover, the use of fuel dyes and markers in coloration of shoe polish, beeswax, lamp oils, candles and much more for commercial purposes is anticipated to keep a steady demand for these products over the forecast period. Petroleum and fuel dyes and markers market are anticipated to record a steady CAGR of 2.4% over the forecast period. Many multi-national companies are concentrating towards new product advances in petroleum and fuel dyes and markers. Moreover, the many advantageous properties of petroleum and fuel dyes and markers are exploited in the field of oils and dyes now and then. Currently the global petroleum and fuel dyes and markers market is observing vibrant growth on account of increasing demand of crude oil products in the market. Advance in petroleum and gas industry in the past few years and growing product explorations is projected to drive petroleum and fuel dyes and markers market besides the wide range of functions of petroleum and fuel dyes and markers in an immense range of products such as lubricating oils, gasoline and petroleum products during the forecast period. 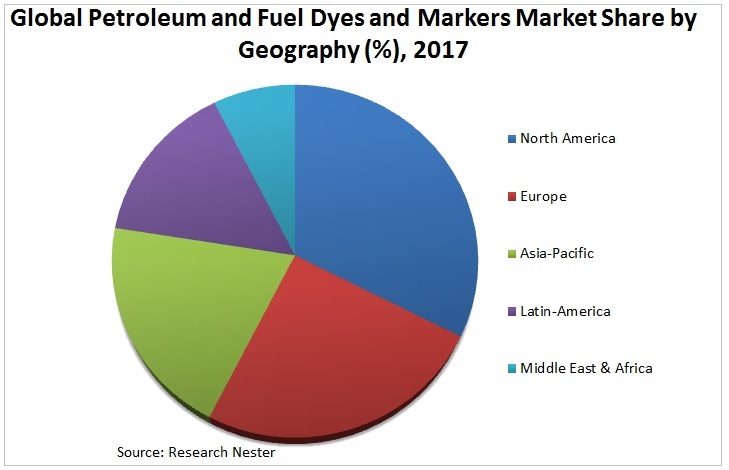 On the basis of regional platform, global Petroleum and Fuel Dyes and Markers market is segmented into five major regions including North America, Europe, Asia Pacific, Latin America and Middle East & Africa region. As a developed region with foremost running petroleum industries, North America is panned to observe substantial petroleum and fuel dyes and markers market growth over the forecast period. North America is estimated to be followed by Europe in terms of petroleum products and oil consumption due to expanding petroleum and fuel industries and their derivative product demand across the region. The petroleum and fuel dyes and markers provides more or less coloring to oils, waxes, lubricants and various other petroleum products which reduces the chances of accidents caused due to crude oils and gases in industries as well as in commercial and residential sectors. These are highly temperature stable colorants which are available in various forms such as granulated, liquid or solvent blended all across the globe. Additionally, increasing governmental regulations regarding fuel compositions and taxes around the globe to reduce the rate of accidents caused due to petroleum products to minimalist is expected to showcase a moderate growth rate during the forecast period. The usage of petroleum and fuel dyes and markers as per government regulations for the purpose of differentiation between low tax fuels, high taxation fuels and tax exempted fuels is anticipated to maintain a steady demand for the petroleum and fuel dyes and markers market across the developed and the economically developing regions. The property of petroleum and fuel dyes and markers have an inherent characteristic of developing color and getting soluble in petroleum hydrocarbons which make them the most appealing choice for various lubricants, waxes and oil coloration to prevent accidents. 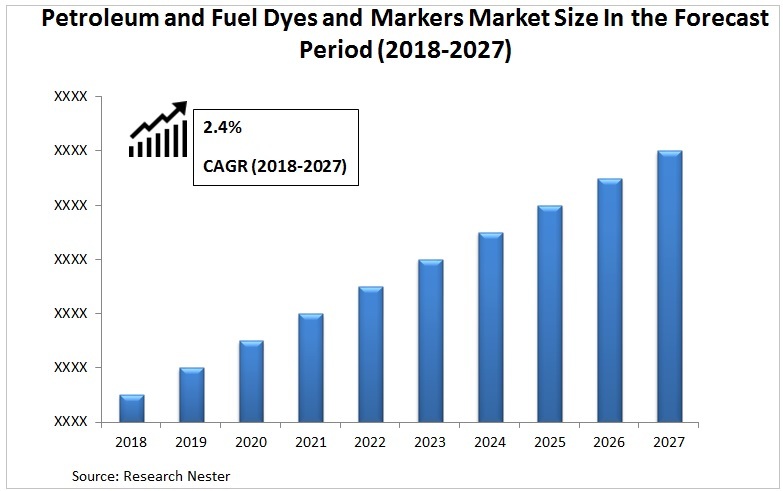 However, increasing environmental awareness along with safety concerns associated with the handling of these types of dyes and markers is anticipated to act as the key restraining factors in the growth of the petroleum and fuel dyes and markers market. Furthermore, cost constraints attached to these types of dyes and markers usage due to the association of this market with petroleum market prices is expected to impart significant doubt in the use of these products among the market players. John Hogg & Co. Ltd.